This emerald-shaped three stone cathedral blue topaz ring is a showstopper of a ring! Set in a 14K yellow gold ring, this design from Apples of Gold Jewelry features three authentic emerald cut blue topaz stones, which are rated AA, with the largest stone sized at 7mm x 5mm and the two smaller stones at 5mm x 3mm. The four round cut diamonds on the sides of the soft blue topaz stones total 0.04 carats and are rated H-I for color and SI for clarity, and add even more sparkle to this bold design! 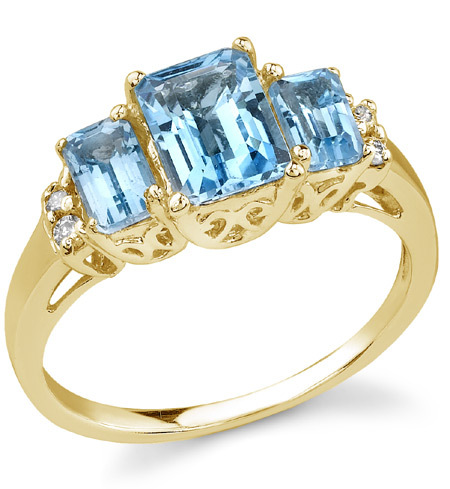 We guarantee our Emerald-Shaped Three-Stone Cathedral Blue Topaz Ring in 14K Yellow Gold to be high quality, authentic jewelry, as described above.